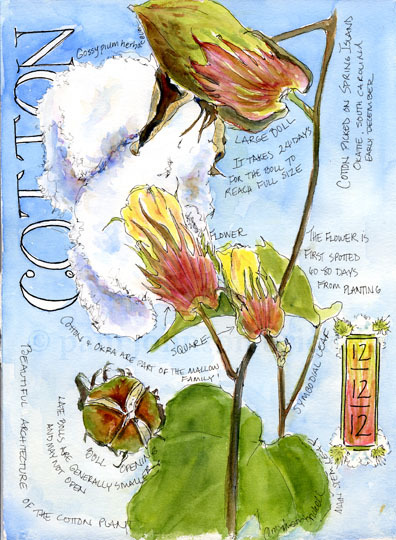 South Carolina LowCountry Nature Journaling and Art: The 12.12.12 Commerative... Cotton! I have a childhood memory of a family friend's treasure box that was filled with interesting organic items she'd found during her travels. I remember exotic shells, all types of stones and a sprig of cotton. A week ago, I had my first one-on-one experience with a field of cotton. What a delight to the eye! I had no idea the plant had such lovely architecture. I picked several cotton sprigs but what really thrilled my eyes were the pale yellow flowers blooming out of a three-sided leaf-like structure with long thin fingers. I brought my treasures home and put the flowering branches in water. After a few days, the pale yellow flowers slowly started to turn the same crimson color of what I now know is called a 'square'. I found a great website that explains the life cycle and gives the names of the various parts of the cotton plant. A 'boll' forms from the flower and it takes 24 days to reach full size. An additional 24-40 days is needed for the fiber to fill with cellulose and the boll to open. I'm tickled that the cotton plant came into my life at this time. It has such a rich history, especially here in the Lowcountry. A special plant for a special day! What a lovely journal page & painting. When I was 11 my parents moved to a suburb of Palm springs CA for the winter for work since we lived in the Snowy mountains. We stayed in a trailer park near cotton fields. It was so much fun to walk around them to see and feel. I wish I had been drawing or taking photos then. This brought that memory back to me. Hi Cris! So glad this page brought back a wonderful childhood memory for you. Sounds like you had a great time running through those fields. I meant to also say that it was a lovely tribute mentioning the names of those who lost their lives last week in that senseless shooting. Those that lost loved ones will grieve for a long long time. Thanks, Cris. Still can't get my head around this horrible, senseless loss. Driven by cotton fields my whole life, never seen them up close... how beautiful.